This was the first album I listened to on January 1 2018. Kind of appropriate really; after hearing so much beered-up musical stodge over the festive period, this is the perfect aural January detox to accompany the real thing. 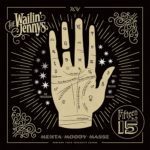 The Wailin’ Jennys (Heather Masse, Nicky Mehta and Ruth Moody) have been together fifteen years (hence the title), but this is their first album in six years. It’s worth waiting for; it’s gorgeous. They interpret nine very different songs but the common thread running through all of them is those three fabulous voices and the heartbreakingly pure harmonies. It’s possible I might mention that again at some point. Everything is built around creating a setting for those flawless voices to deliver interpretations that are technically and emotionally perfect. Generally speaking, the musicians have a fairly light touch throughout the album; this is all about putting those three voices straight upfront and centre. When full string band arrangements are used, they tend to build up in layers to push the song to a higher level, which works particularly well on the timely cover of Tom Petty’s “Wildflowers” and the Jane Siberry song, “The Valley”. “Boulder to Birmingham”, Emmylou Harris and Bill Danoff’s plaintive elegy to Gram Parsons has a full band sound with some lovely two-guitar picking and percussive upright bass; none of it threatens to overwhelm the vocals. For all the subtle and delicate playing, the a cappella or virtually a cappella material that really shines brightly. Paul Simon’s “Loves Me like a Rock” gets the handclap and fingerpop treatment, Dolly Parton’s “Light of a Clear Blue Morning” begins with a solo vocal before the stunning harmonies join, but the best is saved till last. The album’s final song is an a cappella cover of Hank Williams’ “Weary Blues from Waitin’” which not only has the expected beautiful three-part harmonies but features some incredibly precise three-part glissando harmonies. I have honestly never heard that done with such precision. So now you’re going to ask if I like it, yeah? What a great way to start the year. But you don’t have to take my word for it; a click on any of those song links will take you to Spotify where you can hear it for yourself. “Fifteen” is released on True North Records on Friday January 5 2018. I could review the new Corinne West album in one word: seductive. Of course then I’d have to go on to explain that I didn’t mean seductive in the dim all the lights, pink champagne and Barry White sense of the word. “Starlight Highway” seduces the ears and the soul with playing that’s subtle and restrained and harmonies that will melt the hardest heart. The album’s opening song, “Trouble No More” sets the tone with a gentle combination of mandolin, Hammond B3 and Corinne’s multi-layered harmonies augmented by the voice of guitarist Kelly Joe Phelps to create a perfect setting for the pure and seemingly effortless lead vocal. And that’s only the first song. The album never shifts too far from a laid-back Americana/country feel, although there are slight shifts of emphasis, including the jazz-tinged “Gypsy Harbor” and the delicate strummed guitar and subdued piano fills of “Find Me Here”. The stylistic shifts aren’t allowed to undermine the unity of the album, which is held together by the quality of the playing and, particularly, the two main voices working together to deliver perfect harmonies and just the right degree of contrast for the duets that dominate the album, from the delicate “Audrey Turn the Moon” to the classic Nashville sound of “Cry of the Echo Drifter” and the slow country-rock of “A Night Falls Away Singing”. Shades of Gram and Emmylou. The title track is a mandolin-driven uptempo country song with the message that music can be an escape for us, with an additional twist of synaesthesia in the lines ‘Mother she’s a rainbow, Father’s made of sound’ emphasising the multi-sensory nature of music and the visual arts. It’s a great collection of songs (ten in total, all superbly constructed and delivered) and vocal performances to die for from Corinne West and Kelly Joe Phelps. The album’s out in the UK on Friday April 29th on MAKE Records (MAKE7447) and she’ll be touring the UK for the first time in four years from mid-May to early June.